I remember when my mom started making English muffin bread — I was definitely under age 10, probably around eight. It wasn’t memorable because my mom didn’t bake much. She did, I think. She’d bake banana bread or cookies or brownies with my brother and me every other weekend or so. Though, it was mostly just a way to keep us busy; she’d send us outside with a stick of cold butter in a bowl and tell us to sit out there until it got soft, buying her at least 30 minutes of quiet time indoors. Pretty clever, mama! And she would bake bread every couple months or so; more often in the winter since it had the double duty of heating the house which otherwise was only heated by the fireplace. So anyway, the English muffin bread itself was memorable to me — the cornmeal crust, the lightly salty-sweet flavor, the crispiness of the toast it made. I don’t know where she got the recipe, but I know now it’s not uncommon. There are duplicates all over the internet. 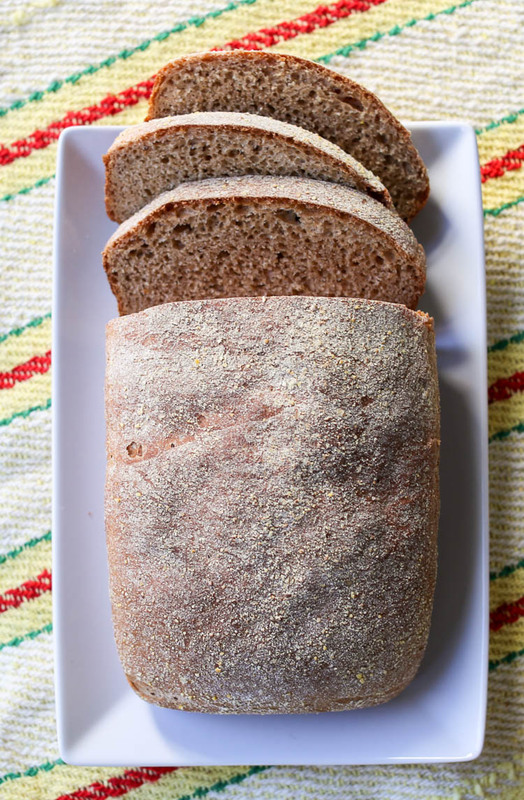 I wanted to take her recipe and modify it to be a whole wheat English muffin bread, since I try to insist that my kid’s diet be majority whole grain, even if I myself can’t resist a nice white bread or a cheap Winchell’s donut. 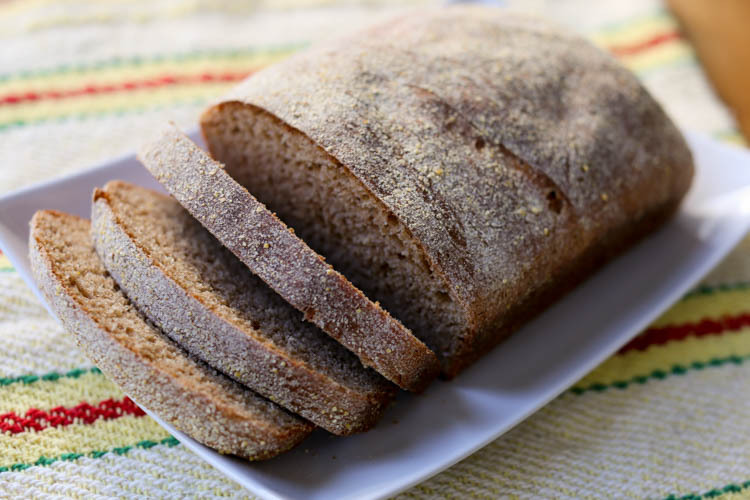 In my experience with homemade whole wheat breads, they are often dense and dry. English muffin bread, while not dense, is what I would consider a “dry” bread, low in moisture and low in fat (which is why it toasts so well). So I would need to add some fat. An egg will do fine. And it turned out great. The End. Scalding the milk: Whyyyyyy???? Well, in baking, it’s to deactivate enzymes that can interfere with gluten protein development. Or so they say. It only takes about 90 seconds in the microwave so I just go ahead and do it without questioning too much when a recipe directs so. You just heat it until bubbles form around the edges of the pot (or the Pyrex cup if you’re microwaving it). That’s all. Then let it cool. Watch it to make sure it doesn’t boil over; that happens in a half a second. I use a 2-cup Pyrex cup to minimize risk. Scald the milk (See notes above) then stir in sugar and salt and butter while still hot. Stir until solids are dissolved and butter is melted. It should be cool enough then to mix in the egg. Pour warm water into a mixing bowl (if you have a standmixer, use that) and sprinkle on the yeast. Add the lukewarm milk mixture and stir. Add 3 cups flour and stir until smooth. Add another 1 1/2 to 2 cups, until you have a soft dough. Knead by hand on a floured board or with the dough hook, adding flour slowly as necessary, until the dough pulls together into a ball. Maybe 5-7 minutes by hand and 2-3 minutes by machine. Rub a large bowl with 1/2 teaspoon of oil and toss the dough ball in to coat it completely. Cover bowl with a damp cloth and place in a warm spot to rise (a turned-off oven or microwave works well if your house is drafty) for one hour until doubled. Punch down and divide into halves. Use the remaining oil to grease two loaf pans (8×4 or 9×5 but 8×4 will make taller loaves). Form each half into a loaf and roll in cornmeal. Place seam-side down into the pans. Let rise again until doubled, 1 hour. Don’t need to cover. Set oven to 400ºF and bake 25 minutes. Cool 5 minutes then turn onto racks and cool completely.